The Pyramid Lake Paiute Tribes’ Reservation is located thirty five miles northeast of Reno, Nevada in a remote desert area located in the counties of Washoe, Lyon, and Storey. The area of the reservation contains 475,000 acres or 742.2 square miles. Out of this acreage approximately 112,000 acres cover the surface of a terminal desert lake, Pyramid Lake. It is entirely enclosed within the boundaries of the Reservation. Pyramid Lake is approximately 15 miles long and 11 miles wide. 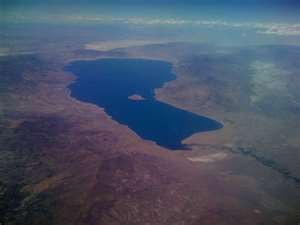 Pyramid Lake measures 350 feet at its deepest point. Pyramid Lake is one of the largest natural lakes in the state of Nevada. Pyramid Lake is also the biggest remnant of ancient Lake Lahontan, the colossal inland sea that once covered most of Nevada. The scenery is spectacular, and the color of Pyramid Lake changes from shades of blue or gray, depending on the skies above. Pyramid Lake is also surrounded by unusual rock formations, including the Stone Mother. Pyramid Lake’s significant role in the history of the Paiute Indian tribe also adds to its mystique and many myths and tales surrounding it. Pyramid Lake is fed by the Truckee River after leaving Lake Tahoe upstream and enters the lake from its southern end. There is no outlet, with water leaving only by evaporation, or sub-surface seepage. The lake has about 10% of the area of the Great Salt Lake, but it has about 25% more volume. The salinity is approximately 1/6 that of sea water. Lake Tahoe forms headwaters that eventually drain to Pyramid Lake through the Truckee River. The Lahontan Cutthroat Trout (Oncorhynchus clarki henshawi) are an over 2 million year old fish. Cutthroat trout are named as a result of anglers in the 1880 naming them due to their distinctive red slashes below the gill openings. It has been reported that a Lahontan Cutthroat Trout (LCT) was caught over 80 pounds (USF&WS, 2007). In 1925, Johnny Skimmerhorn caught an LCT that was 41 pounds. Historically, LCT occurred throughout the Truckee River drainage from the headwaters in California downstream to Pyramid Lake (Gerstung, 1988). However, multiple impediments have led to the listing of this species as threatened under the Endangered Species Act. Today, the fisheries promotes managing for trophy-sized fish and maintaining viability within the ecosystem within the lake. You do not need a State of Nevada Fishing License, just a Tribal Fishing and/or Boating Permit. Boats are required to have current registration from their respective state. Barb less hooks only. We are concerned only with what hooks you have in the water, not your tackle box. You can have 2 singles, 2 doubles or 2 treble hooks per lure. No Bait. No worms, eggs, scent, Power bait or like products, or any organic matter on your hooks. Slot sizes. Keepers are 17 to 20 inches or over 24 inches. All other sizes must be returned to the water. You may keep 2 of the smaller sizes or 1 small and 1 large. One stringer per fisherman, no sharing of stringers. Do not fillet the fish on the Reservation. Rangers need to verify proper size. You can fish 1 hour before sunrise and 1 hour after sunset. Highly recommend boaters have a marine band radio on board. The Ranger Station monitors Channel 16. Coast Guard considers marine band radios as essential part of your boat safety equipment. and docking, and to the fisherman. 11. Lahanton Trout Season runs from October 1 thru June 30.